In the small hours of the morning, Abi is startled awake by a phone call and learns that her teenage daughter Olivia has fallen off a bridge. Not only is Olivia brain dead, she’s pregnant and must remain on life support to keep her baby alive. And then Abi sees the bruises circling Olivia’s wrists. When the police rule Olivia’s fall an accident, Abi decides to find out what really happened. Was Olivia’s fall an accident? Or something far more sinister? A domestic suspense novel set around Puget Sound’s coast in Washington State, The Night Olivia Fell asks how well we ever really know our children, weaving together a story of family secrets and devastating lies. “A stunning thriller that instantly grabbed me by the throat and wouldn’t let go until the final poignant sentence. McDonald artfully brings to the page the emotionally fraught, complex relationship between mother and daughter in this atmospheric, absorbing page-turner. The Night Olivia Fell cracked my heart into a million pieces and then slowly pieced it back together again.” –Heather Gudenkauf, New York Times bestselling author. “In Christina McDonald’s The Night Olivia Fell, Abi gets the call every mother fears: her daughter has fallen from a bridge and is brain dead…but was it an accident or a crime? McDonald reveals the answer in steady, page-turning increments, a gradual unfolding of truths and long-held secrets that culminates in a heart-wrenching resolution. A suspenseful debut that packs an emotional punch.” –Kimberly Belle, internationally bestselling author. “Christina McDonald has crafted an emotionally-charged mystery that will leave readers equally gut-wretched and gripped. The Night Olivia Fell welcomes a talented new addition to the world of domestic suspense.” –Mary Kubica, New York Times bestselling author of The Good Girl and When The Lights Go Out. 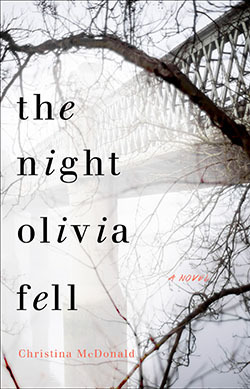 “Christina McDonald’s The Night Olivia Fell takes a mother’s worst nightmare to a whole new level. This is an intense, twisting, heartbreaking thriller that explores in painful detail the consequences of family secrets. The reader will be riveted until the final page…and may even feel a bit of hope when all is said and done. Don’t miss this one!” –David Bell, bestselling author of Somebody’s Daughter. “I was absolutely hooked, it was such an emotional read that I was broken by the end. Heartbreaking and thrilling at the same time.” –Jenny Blackhurst, bestselling author of How I Lost You. “Beautifully written and moving with characters I felt I knew, The Night Olivia Fell is a stunning debut that kept me guessing right until the final, heartbreaking twist.” -Claire Douglas, Sunday Times bestselling author of The Sisters, Local Girl Missing and Last Seen. Get Literary – Escape the Cold With New February Fiction!